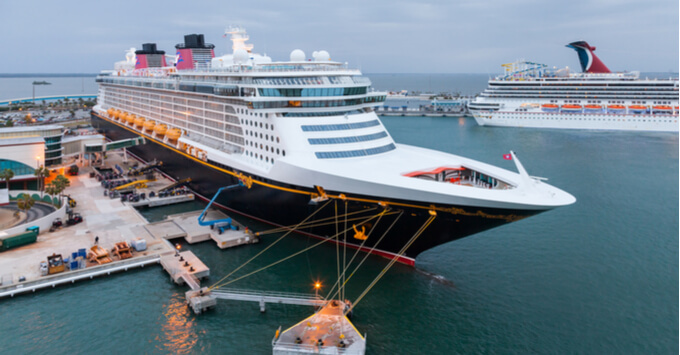 (5:20 p.m. EDT) -- Port Canaveral is gearing up for a wave of brand-new cruise ships, including two from Disney Cruise Line slated to debut in 2021 and 2022. The unnamed ships will homeport in Port Canaveral -- most commonly associated with Orlando, which is only 45 miles west -- the port's CEO John Murray said during the Canaveral Port Authority Board of Commissioners meeting on August 29. (Murray's comments begin at approximately 1:32:20 in this video.) They will be Disney's first new-builds since 2012. "If you look at what's going to impact Port Canaveral in the near term, you've got Carnival [that] will have the first ship, immediately followed a year later by Disney, immediately followed a year later by another Disney ship," he said. Carnival Cruise Line recently revealed its new ship launching in 2020, which will be not only the largest in the fleet but also in the world by passenger capacity, also would call Port Canaveral home. "Disney's got a total of three [new ships on schedule to launch]. We don't know if we'll have two or three of those ships, but they're coming to Port Canaveral." The third ship, due to launch in 2023, will be a sister ship to the first two. Details about the ships, as well as the itineraries they will sail from Port Canaveral, have yet to be revealed. The line offers pre- and post-cruise packages to Disney World on cruises out of Port Canaveral, which are offered year-round by Disney Dream and Disney Fantasy.